Over the years, LBL's Bevalac was often snatched, from seemingly inevitable closure, to be reborn each time into a whole new productive chapter of its career. But at last it seems to have finally used up all of its nine lives. Since its commissioning almost 40 years ago, the venerable particle accelerator has made major contributions to four distinct areas of research: high-energy particle physics, nuclear heavy-ion physics, medical research and therapy, and space-related studies of radiation damage and heavy particles in space. As the Bevatron/Bevalac neared the end of its usefulness in each of these fields, the area of research it had pioneered moved to other facilities around the nation. Thus, particle physics continues at accelerators such as Fermilab's Tevatron, SLAC's colliders, and in the future, at the proposed Superconducting Super Collider. Heavy-ion nuclear studies will be the major focus at the new Relativistic Heavy Ion Collider (RHIC) at Brookhaven, and experiments in heavy-ion therapy led to the design of dedicated medical accelerators such as the Proton Cancer Treatment Center at Loma Linda University Medical Center, and the proposed proton therapy facility at the UC Davis Medical Center. The original version of the accelerator, the Bevatron has been called by physicist Ed Lofgren (who was in charge of its operation from 1954 until his retirement from that job in 1979) "the last of the great accelerators build in ... `the Lawrence style' ... durable and adaptable. That's why it's not surprising that the Bevatron has endured and adapted so well over the years." The Bevatron played the leading role in three of the most important discoveries of particle physics: experimental studies of "strange" particles leading to the discovery of parity nonconservation (the first known example of a lack of symmetry in nature); the discovery of nuclear antimatter (the antiprotons and the antineutron); and the discovery of the "resonances" -- the particle explosion of the 1960's that led to the development of the quark model and the current understanding of the basic nature of matter. In the 1970s, the Bevatron seemed to be nearing the end of its useful career in high-energy physics, and there was talk of shutting it down. An LBL proposal to replace it with a new accelerator known as the Variable Energy Nuclear Synchrotron (VENUS) never received the necessary approval and funding. Nevertheless, it was given a productive new lease on life through the invention of the Bevalac, in which the Bevatron was linked to the SuperHILAC linear accelerator. Nuclei begin their journey in the SuperHILAC and then were passed through a transfer line to the Bevatron, where they were accelerated almost to the speed of light. With the later addition of an improved vacuum system and other modifications, the Bevalac became the only machine the world capable of accelerating all of the elements of the periodic table to relativistic energies. The Bevalac pioneered a whole new field of physics, leading to the studies of the nuclear equation of state and the search for "quark matter." A major discovery of this era was the observation of compressed nuclear mater. Also during the `70 and `80s, the use of Bevalac beams in medical and biological research became an important part of the program. Because such ions deposit most of their energy near the point at which they come to rest, a heavy ion beam aimed at a deeply buried tumor can destroy the tumor without seriously damaging tissues in its path. Bevalac beams were found to be useful in the treatment of cancer and other diseases, especially ocular melanoma and arteriovenous malformations in the brain. With the closure of the Bevalac, research in heavy-ion therapy will no longer be conducted in the U.S> but will be shifted to Japan, using technology developed at LBL. In 1988, LBL proposed a major upgrade of the Bevalac that would replace the weak-focusing Bevatron with a modern strong-focusing synchrotron, greatly increasing its beam intensity, beam quality, and other significant factors. It also would have permitted fast switching between different kinds of beams, allowing the machine to accommodate both nuclear science and medical radiotherapy programs simultaneously. Had the upgrade been approved, it would have brought the Bevalac back to the forefront of modern experimental machines and assured its continued usefulness through the `90s and beyond. Nevertheless, during the last few years the Bevalac achieved another important success when its beams of heavy ions were used to mimic the conditions that astronauts might encounter on the moon, Mars, or on interplanetary voyages. Bevalac beams were used to calibrate and check out scientific equipment due to be carried on satellites or shuttle missions, and Bevalac experiments led to a better assessment of the risks associated with space flights. It was this program that, over the past year or so, seemed to offer the best hope for the Bevalac's continued survival. NASA, realizing that the Bevalac is the only facility in the country capable of simulating the spectrum of radiation native to space, argued against its closure, and for some time considered taking over the funding of Bevalac operations from the Department of Energy. However, in this era of tight budgets, this prospect also faded, and the Laboratory will end operations at the Bevalac in 1993. The closure also spells the end of a long and honorable career for the "uphill " member of the tandem Bevalac team, LBL's SuperHILAC. 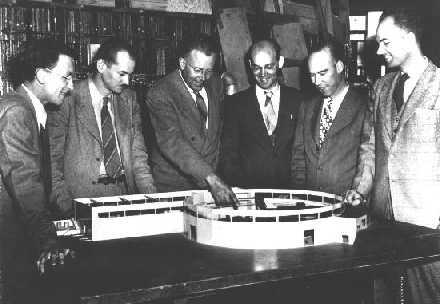 Like the Bevatron, the SuperHILAC and its predecessor the HILAC figured in several distinct epochs of successful scientific endeavor. Probably no other machine in physics has so ambitiously been "tinkered upwards" in its lifetime. First built as the HILAC (Heavy Ion Linear Accelerator) in 1957, it (along with a similar one at Yale University) was the first machine in this country built specifically to accelerate heavy ions. The HILAC was modified to new capabilities in 1961, 1965, and 1969, and finally completely rebuilt into the SuperHILAC in 1971. As HILAC and SuperHILAC, the machine figured in the discovery of five "manmade" or elements by Al Ghiorso and his team. In recent years, the SuperHILAC's independent research program was phased out, and it operated principally as the injector for the Bevalac.